Giuliano Agostinho de Castro ’20 lives in a house a few miles from the River Campus with two fellow University of Rochester students. One is in the doctoral program at the Warner School of Education, and the other is pursuing a master’s degree in history. They study together, ride to school together, dine together, and swap family stories. The stories are often the same, because Giuliano’s housemates are also his parents. Giuliano was paralyzed from the chest down in a car accident in his native Brazil two years ago. His parents, Gilberto and Marcia, moved to Rochester to be his caretakers and decided to further their education at the University. They’re 5,000 miles from home, three students bonded by hope, love, and college. Giuliano and Marcia (pronounced Mar-SEE-uh) are scheduled to graduate in 2020. Gilberto, a former business executive, hopes to receive his doctorate in education in 2022. The fall 2016 semester, Giuliano’s first at Rochester, was a huge success. “My roommate was great, my classes were great, and I joined the club rugby team,” the business and economics double major says. When winter break came, he flew home. It was time to surf, sleep, and reconnect. He celebrated New Year’s with friends in Buzios, an ocean resort, and left January 3, 2017, for the long drive back home. Giuliano and two friends started out at 5 a.m. to beat the traffic, and he scrunched his six-foot frame on the back seat to sleep. When he awoke, the passenger door near his head was gone, and a stranger was standing in the opening to block the sun from shining on Giuliano’s face. “I can’t move my legs,” he said. They rented a helicopter to fly him to Rio for surgery, knowing he wouldn’t survive another marathon ride on bumpy roads. “We were racing the clock,” Marcia says. Three weeks later, they endured a 17-hour flight to Chicago, and Giuliano underwent a second surgery at Northwestern Memorial Hospital before being admitted to the Rehabilitation Institute of Chicago. He was now a quadriplegic. “Everything I taught him in his first years—dressing, bathing, using the toilet, and walking—had to be relearned,” Marcia says. Although Giuliano says it was “a depressing period in my life,” he remained dedicated to the journey he had started months before. “I have to stay in school,” he told his parents. Jolliff reached out to two faculty members who offered courses that interested Giuliano. She asked them: would they permit him to enroll remotely? Both were eager to help. “I was teaching Big Business in the South: Business History of Brazil for the first time, and I knew Giuliano would be able to follow the course themes and access course materials [online],” says Molly Ball, a lecturer in history, who also taught Marcia in one of her graduate courses last semester. “It gives me great joy for the entire family knowing that he continues to improve,” she says. Mark Wilson, a lecturer in entrepreneurship at the Simon Business School also was eager to accommodate Giuliano—as were other students in the class. When Giuliano enrolled in Wilson’s Entrepreneurship 101, a student working for Event and Classroom Management took videorecordings of each class and uploaded them for Giuliano. At the end of the semester, Giuliano went home to Brazil for the summer. When he returned to Rochester in August, his parents came with him—and stayed. 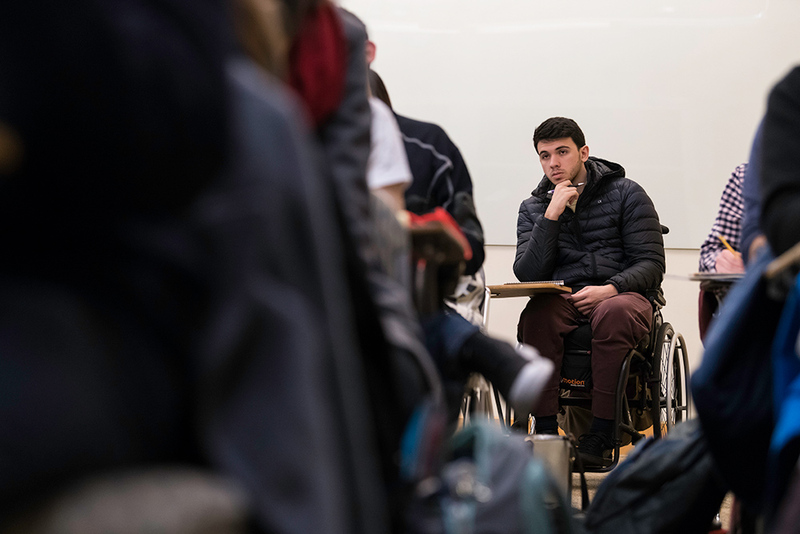 Giuliano attends professor Sevak Mkrtchyan’s calculus class in Goergen Hall. Staff from the Office of Disability Resources, the Office of the Registrar, the International Services Office, University Facilities and Services, and University IT coordinate to support Giuliano on campus. Moving to the United States wasn’t easy for Gilberto and Marcia, but they had the means and the time. Their daughter, Mariana, attended secondary school in England and soon would enroll at the University of Southern California. Gilberto had quit his job two months earlier as CEO of Estacio, a higher education company in Brazil, looking for new challenges and more freedom. Marcia took a leave from her job as a professor of engineering at University Estacio after the accident. The family rented an apartment in downtown Rochester, one with only one elevator. Once, it stopped working, and Giuliano had to be carried down five flights of stairs so he didn’t miss class. A few months later, they bought a one-story ranch house in Brighton, a suburb close to the University. Gilberto took several classes at nearby Nazareth College to improve his English, and it whet his appetite for being in the classroom. He already had a master’s degree in industrial engineering, while Marcia has a PhD in the same field. But they craved more, for different reasons. “When I heard about the Warner School, I knew it was an opportunity to help me do better what I’ve done the last 10 years in Brazil,” Gilberto says. Each day, they drive to school and split off to their own classes. Giuliano was a workout fanatic before his injury and still spends hours daily lifting weights and using equipment that utilizes functional electrical stimulation—a technique that emits low energy electrical pulses to artificially generate body movements in people with paralysis. Each night, they drive home, eat dinner, play with their dog, Chico, and spend quiet hours studying. 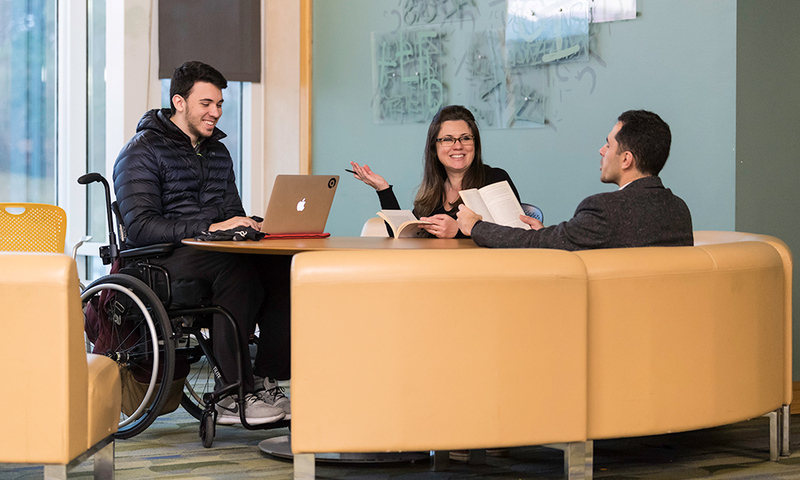 Navigating the campus in a wheelchair was challenging to Giuliano, but he met with Liz Carpenter, access coordinator for the University’s Office of Disability Resources, to design a plan. Carpenter examines Giuliano’s schedule before each semester to make sure he’ll have time to get from one class to another. “If he doesn’t, I work with the Registrar’s office and we move a class closer,” she says. Carpenter also coordinates with Classroom Management to ensure furniture and classroom layout will accommodate Giuliano’s wheelchair. And, she develops a plan so the Department of Facilities and Services can clear a path to accommodate his wheelchair on snowy days. Wanting to stay active on campus, he joined an international committee in Students’ Association government and Sigma Phi Epsilon fraternity. Doctors originally painted a grim outlook for Giuliano. His spinal cord injury was classified as type A. “It means no hope,” Marcia says. The chances of him walking again were slim—but that chance has kept him motivated. When fall and spring recess come, he visits the Kennedy Krieger Institute at Johns Hopkins Medical Center in Baltimore for two weeks. He works out eight hours daily at their International Center for Spinal Cord Injury. He swims, uses a robotic exoskeleton to help him “walk,” and receives other forms of electrical therapy. Despite his injuries, Giuliano has never missed a single semester, and is on track to graduate in 2020. Giuliano doesn’t know what career he plans to pursue, but he has applied for summer internships to companies in Chicago, Miami, and San Francisco. Recently, he was asked during a Skype interview to describe a situation where he did the opposite of what everyone told him. Walking beside him will be his parents.